Every once in a while you see something that inspires you. Something that motivates you to keep doing what it is you do. This can be anything – a person, a story, a movie, etc. Myself, I get most of my inspiration and motivation from the stories of other people. People that have an interesting story to tell. People that try to make a difference. People that LIVE. 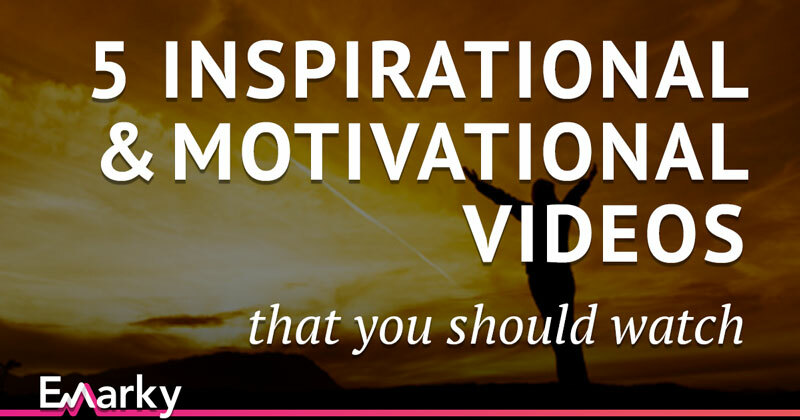 Some of these stories are captured on video in a great way, making these short videos inspirational and motivation in itself. I’d like to share a few videos that inspired me, and I would recommend watching them all. You probably already know some of them, but trust me: it can’t hurt to watch these videos again. Note: I’ve written this post a few years back when I attempted to start Emarky.net initially.. Since I liked these videos a lot, I figured to re-publish this post. Into The Wild, definitely one of my favorite movies out there. It’s a true story about Christopher McCandless, a young guy that burned his money, thrashed his car and started doing what he really wanted to do: traveling. Truly inspirational, and he was 100 % right: If you want something in life, reach out and grab it. I recently came across this video. The voice-over is a motivational speech from Sean Walker. You’ll understand why I put it here. Watch this video, and you’ll see with your own eyes that everything is possible. Not a movie about one particular person or story, but it still works very motivational for me (as an entrepreneur). It’s made by the guys behind GrassGopper. I’d recommend watching all 5 short videos. It’ll only take a few minutes of your time, and I promise it will be worth your while. Let me know which one works best for you!